Hawaiian Eye: Mystery and Suspense on Television. Anthony Eisley and Robert Conrad star as private investigators Tracey Steele and Tom Lopaka in Hawaiian Eye, a crime drama that aired on ABC for four seasons. It is one of four similar series the network produced at about the same time: 77 Sunset Strip set in Hollywood, Bourbon Street Beat set in New Orleans, and Surfside Six set in Miami. 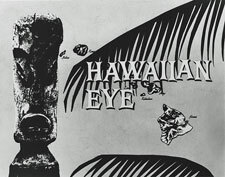 The exotic appeal of Hawaiian Eye was enhanced when Hawaii was granted statehood during its first season. Note: Media availability may change without notice. Page Authorship: Omnimystery News.